The real fight over granting United States President Barack Hussein Obama broad trade-promotion authority is in the House of Representatives. So don’t delay in giving your House member input by calling 202-225-3121, or 224-3121. Just ask for your representative by name when the Capitol operator answers. Just before Memorial Day weekend, the Senate gave Obama a green light on this so-called “fast track” power to quickly wrap up massive international trade treaties. 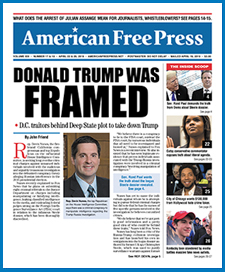 AMERICAN FREE PRESS was told by an office aide for Congressman Adrian M. Smith (R-Neb.) that the House very likely will bring the fast track bill (HR 1314) to the floor around Wednesday, June 10. That aide handles trade matters for a Congressman who’s on the Committee of Ways and Means, which has trade authority and is chaired by Representative Paul D. Ryan (R-Wisc.) Ryan’s a free-trade fanatic whose Ways and Means underlings, including Smith, have been sending op-ed columns across the nation to major newspapers. Worse yet, these papers’ own editorial boards, with no apparent exceptions, have been stumping for fast track without even a hint of objectivity or balance. The immediate goal of the trans-nationalists is to give Obama the TPA gavel before he’s out of office so he can wrap up the 12-nation Trans Pacific Partnership and the Transatlantic Trade and Investment Partnership, a U.S.-European Union scheme. Most Republicans are so romantically (and perhaps financially) attached to free trade deals that their party’s newfound control of the Senate, taken away from the Democrats in the 2014 elections amid great fanfare, clearly did not translate into denying Obama that fast-track trade authority. Indeed, when it comes to the seductive plan to mold the U.S. into an export-dependent economy—which tends to hurt national self sufficiency—the two parties make even greater strides to behave like one party. So, the Republican’s so-called opposition to the Obama agenda, concerning the forced health insurance known as Obamacare, unchecked immigration and needless gun control laws, freezes solid in midair when it comes to free trade. Only backdoor corporate strong-arming can explain this odd bipartisan harmony on a single issue. “Conservatives” and most libertarians either are silent or support free trade under vastly mistaken notions of what it means. Instead, it takes progressive groups like the Coalition for a Prosperous America (CPA), Food Democracy Now and other like-minded outfits, as well as progressive politicians, to even mention the many fallacies of modern free trade. In an online legislative alert, CPA noted that Obama is working with the Republican leader of the key Ways and Means Committee to please the plutocratic corporate backers who support TPA and the big trade deals to which it would lead. Claiming to represent the heads of U.S. companies “from every sector of the economy,” the powerful Business Roundtable announced its elitist elation over Senate approval on May 22 of the fast-track bill entitled the Bipartisan Congressional Trade Priorities and Accountability Act of 2015. Yet the Roundtable’s membership has no one who clearly represents genuine small business, and certainly none who are Main Street mom-and-pop local businesses. The Roundtable’s typical members include infamous top-tier bankers like James “Jamie” Dimon of JPMorgan Chase & Co. and Lloyd C. Blankfein of Goldman Sachs Group, Inc. Both men and/or their institutions are wrapped up in behind-the-scenes globalist groups such as the Trilateral Commission (TC), which manipulate politics, foreign policy and economic policy out of public view while the press remains silent. Those and other Roundtable firms also show up on the Bilderberg roster much of the time. Such CEOs are emblematic of a corporate culture that seeks global systems at the direct expense of local and national economies, their specious claims to the contrary notwithstanding. Plus Goldman has a literal revolving door with the U.S. Treasury, as recent former Treasury Secretaries Henry Paulson and Robert Rubin hopped right from Goldman to Treasury over the last few U.S. presidencies, while Timothy Geithner came from the New York Federal Reserve Board and current Treasury Secretary Jack Lew came from Citigroup. All these entities have been represented at both TC and Bilderberg meetings, where power and secrecy, and public and private agendas, merge.